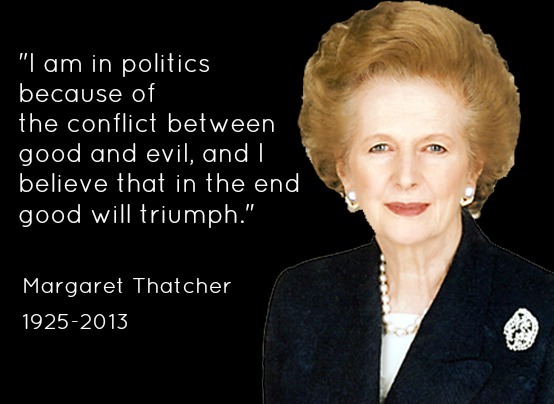 I was saddened to hear of Margaret Thatcher’s passing. The first woman elected to lead a major Western democracy, Thatcher served as the British Prime Minister from 1979 to 1990. Whether you agree with her politics or not, the Iron Lady was an influential leader and a staunch champion of freedom and democracy during the Cold War. Do you want to achieve greatness? The life of Margaret Thatcher provides five steps to becoming a leader who can inspire others and change the world. If you want to achieve greatness, you have to have the ambition and dedication to succeed. That means you have to work harder towards achieving your goals. Before entering the political field, Thatcher worked hard at her studies and distinguished herself in school. She won a prestigious scholarship to study chemistry at Oxford where she was tutored by Dorothy Hodgkin (Hodgkin was an eminent scientist who advanced the technique of X-ray crystallography and would go on to win a Nobel Prize in chemistry). While in college, Thatcher juggled her chemistry studies with her membership in the University’s Conservative Association (she was soon elected president of the association). After graduating, Thatcher worked as a research chemist, though she continued to nurture her political ambitions. Of course, we all know how those political ambitions turned out. Thatcher had accomplished much by becoming a research chemist. But she wasn’t satisfied. In the 1950s, she decided to study law, passed the bar exam, and became a barrister, specializing in tax law. She didn’t stop there. In 1959, she was elected to Parliament. In 1970, Prime Minister Edward Heath appointed her Secretary of State for Education and Science. In 1975, she was elected Leader of the Opposition in the House of Commons. By 1979, Margaret Thatcher had become Prime Minister of the United Kingdom. Ultimately, you’ll never know your potential for greatness if your dreams are small. Strive for more, and you will accomplish more. Do great work, and you will achieve greatness. In the end, Thatcher’s perseverance paid off. Nearly eight years later she was elected to a political office. Thatcher’s experience demonstrates that the road to success is not always easy. Often it is long and arduous. You must have the determination and relentless drive to keep working towards your goals, even when success seems very far off. People who change the world for the better are not those who pursue fame and riches. They are the ones who fight for a cause they believe in, who have the courage to unflinchingly stand up for their ideals. Thatcher refused to back down from her conservative economic policies, though they won her many enemies even within her own party. Thatcher’s advice to young future leaders? “Don’t follow the crowd, let the crowd follow you.” Tweet this! What are you waiting for? Don’t just fill up a notebook with a list of all of the things you want to accomplish. Start accomplishing them today. Do you want to shape the currents of history? Begin working to create something you can contribute to the world. Train yourself to dream bigger, think positively, and have the determination to never give up on your dreams. Don’t choose the easy way out by compromising your beliefs, but seek to live your life as an inspiration to others. What steps will you take today so you can achieve greatness tomorrow? Great Post! I was so sad when I heard of Margaret Thatcher’s death. She certainly was a grafter. I hear she only slept about 5 hour per night because she was putting so much time into her work. This is a lesson especially to people looking to make money online. Quit looking for short cut way to earn cash, and start putting the effort in so that you deserve it. Then you are not trusting to luck. People spend far too much energy trying to game the system, which nearly always fails. That energy could be put into actually building a great business. Yes, she was definitely a remarkable woman: amazingly self-motivated. Great point about how shortcuts rarely result in success. Only putting in your best effort and working hard will result in something truly great.